It is very hard to tell when and how the idea to create a mobile application for our E-Pustakalaya started. However, it certainly was the advantage of applications alike these being handy, easy and accessible that attracted us towards creating one for our E-Pustakalaya. This application would give direct and free access to the massive collection of books for avid readers and book enthusiasts. It would satisfy our goal of making the books available to many users as possible. So it started and we developers of OLE Nepal got a new thing to learn about. Oh yes! We were all very excited about the app. Utility software we used for app development – Android Studio, was in beta version, but this Integrated Development Environment (IDE) was a great tool and we coded our app in this version. We remember there being two or three design proposals for how the app would look like, before we finalized one. First, application programming interface (API) was created which would be used by our application to connect with the server and extract the required information to be displayed on the app. The development of the client side (mobile) application was conducted simultaneously. The difficult part was to understand the database of the books in E-pustakalaya. It really took us significant amount of time to figure that out. After a months time, we had one more friend joining our team for its development. Now there were three excited ones ready to bring the app down to the android mobile. The application was growing faster and smoother. It started to babble and communicate with the server for what it required. It was definitely growing beautiful. 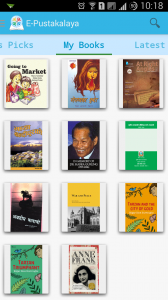 Almost ready to be deployed to the play store, we had developed a fully functional E-pustakalaya app which could now get the E-pustakalaya library to small handheld android devices (by padilla). Users now would be able to explore the library under seven different categories, Arts, Literature, Course Materials and number of subcategories under each of them. Also the list of the books were sortable ascending or descending based on author, date and name. We also added a search feature to the app which would be beneficial for users to find the books using keywords. Home screen displays three other useful categories which would show featured, user downloaded and latest books from the library. The user interaction of the application is practically standard which assures our users an easy navigating system. We had options on how to access the library online via “pustakalaya.org”, offline via school server and some other internet protocols which could server the library content. Now, there is one more easy option added to the list. A single banook selected can show you important details including name of the book, author’s name, book size (units referring memory size for storage), brief summary about the book, etc. A download button is shown if the book is not already downloaded, else option to open or delete the book are shown. Thanks to all our OLE Nepal team who helped us test it, by allowing to install the application on their devices and to spot any bugs. Moreover, there were many fixes and improvements during the testing phase which made the app more mature in compare to other android applications on the galaxy of Google play store. There are plans to upgrade our app with more interesting features in coming days. 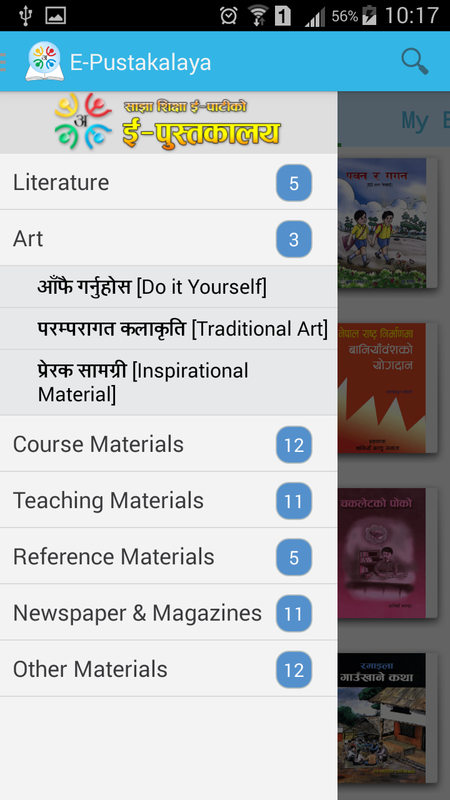 Do explore our “E-Pustakalaya” app and give us feedback on interesting features that can be added to the application. Looking at Google Play it seems that downloaded (locally stored) books are expected to be pdf format. Why not epub? Also, what is the nature of the server side software supporting the app? Thank you for suggestion. BTW with our current resources, we were able only with pdf. We shall think about that too. For your last question, we would be pleased to reply you through our email olenepaldev@gmail.com. Teacher’s training: A wonderful experience! © 2019 Open Learning Exchange Nepal. All rights reserved.